As a platform for design, collaboration, and visualization, Autodesk Revit is widely used by architecture, engineering, and construction professionals for all sorts of projects. But getting the most out of this versatile, impactful software often depends on what hardware you're using. Revit is building information modeling (BIM) software that allows AEC professionals to plan, design, construct, and manage their building or infrastructure projects. Highly collaborative and multidisciplinary, Revit allows users to accomplish a wide range of workflows: from design (structural simulations) to coordination (centrally shared models) to visualization (3D modeling). Revit also allows different team members to complete a variety of tasks on a single, unified model. This way, architects can optimize building performance, structural engineers can evaluate building components, and construction professionals can assess design and determine what materials they will need. Considering the multifaceted work that goes on in Revit, having a workstation to support it all is crucial to performance and productivity. Revit allows AEC professionals to accomplish all kinds of tasks related to building design and modeling, from high-level workflows like structure conceptualizing to more nuanced functions like adding stairs and railings, as well as pipe-flow simulation. This wide and varied breadth of capability that Revit grants users is crucial to project collaboration and progress. In order for Revit to work to its full potential, however, users need a workstation that drives software performance. This begins by understanding that Revit is a frequency-bound application meaning that it predominantly draws from one CPU core, which makes core speed a more important variable than the number of cores. 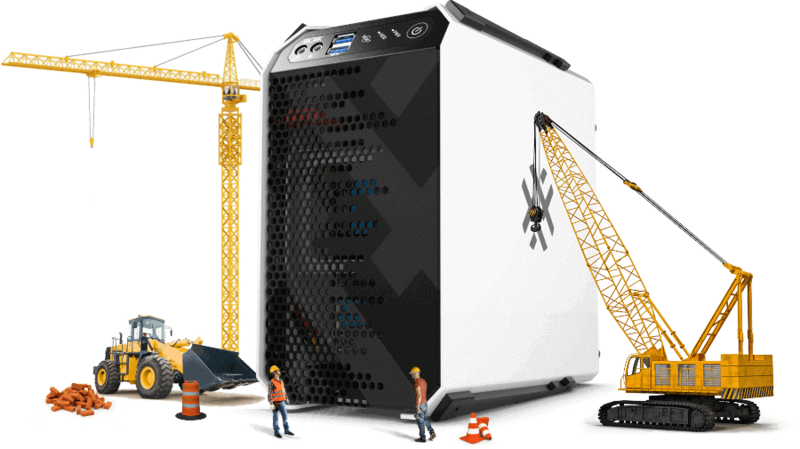 Preferred Revit workstations like the APEXX S3 accelerate creative workflows by offering a professionally overclocked 5.1 GHz model which also includes 64GB of memory and support for up to three GPUs. Revit comes stocked with a library of materials to enrich your diagrams with surfaces, textures, and lighting, among other options. AEC professionals can also create their own materials while taking advantage of the various CPU and GPU rendering engines available within the application. Whether you rely on V-Ray or Octane Render, BOXX APEXX workstations are designed to have all your software needs covered, be it with improved CPU power or the number of GPUs. With a preferred Revit workstation, AEC professionals can manipulate 3D objects faster, more rapidly iterate, and reduce turnaround time. AEC professionals are perpetually on-the-go. When you have to present to stakeholders or simply work remotely, you need a Revit workstation that can keep up and still offer the same functionality. BOXX knows exactly what a capable Revit laptop must boast to handle large data sets and we've configured leading workstations for using Revit while mobile. Those options include both the 3.7 GHz GoBOXX MXL with desktop-class Intel® Core™ i7 CPUs and 64GB of RAM, as well as the ultra-thin GoBOXX SLM featuring NVIDIA Quadro graphics.